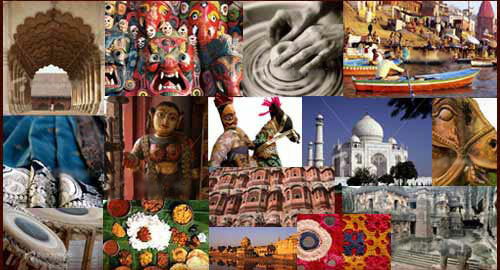 India is a land of rich cultural heritage and diversity. Because of this, much advancement has occurred resulting in many new types of architectural and historic buildings being constructed every now and then. There are many places in India with such improvements. Among them Agra is probably at the top of the list. Tourism in India is at its peak today, all of which is due to the fact that many such wonderful places exist today that people would want to come from faraway places so that they can have a view at the magnificence that lie before them. Agra has been under the influence of the Mogul kings for over four centuries. Because of this many buildings and beautiful places are constructed here since long ago. 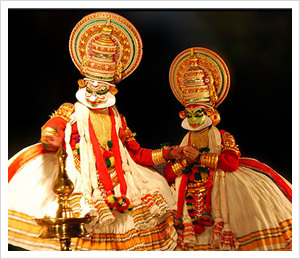 This place has become so much popular that any tourist who comes to India will want to this visit this place no matter what. When it comes to visiting Agra, the most notable and probably the most famous of all the places in India is the Taj Mahal. 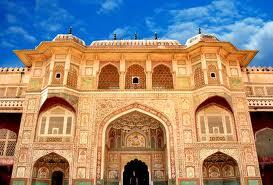 It was constructed in the year 1632 by the then Mogul Emperor Shah Jahan. 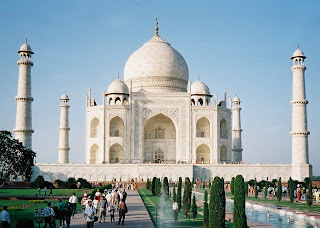 He constructed this beautiful white structure in memory of his dead wife Mumtaz Mahal. This building is a mixture of Turkish, Persian and Indian construction styles. Its construction was completed in the year 1453, almost after 22 years since the construction began. This amazing structure is called the jewel in the Muslim Style of construction in India. It is a dome shaped structure which involved over thousands of craftsmen. It is symmetrical shaped structure with a dome at the center. The building is located at the banks of the great River Yamuna.This also adds to the scenic beauty of the structure. Inside this amazing structure is like a whole new world. The walls inside the Taj are filled with designs by the artisans. Several precious gems are used for decorative purposes. There is an Octagon shaped structure in the inside which is highly decorated. The interior walls are over 25 m and there is a false sun motif decoration at the top. The graves of the great Mogul Emperor Shah Jahan and his wife are at the center of the structure. This is not very highly decorated as Muslim tradition forbids grave declarations. Surrounding this beautiful structure is a 300 m² square meter garden called the Mogul garden or Charbagh. 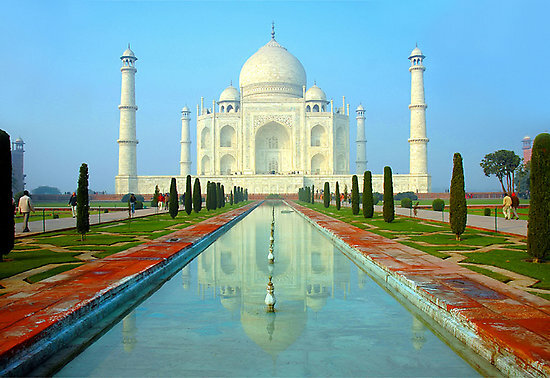 The Taj Mahal is considered one of the 7 modern wonders of the world. This is one of the historic achievements of this great structure. 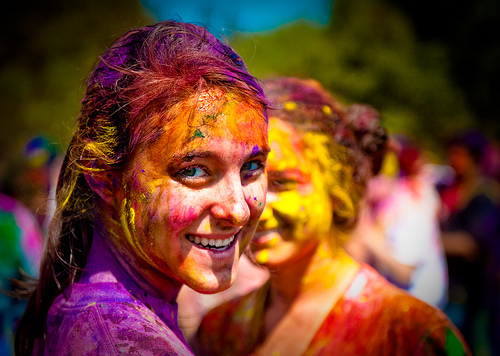 There are many other places to visit in Agra besides the Taj Mahal. One such place is the Sikandra Fort. This was constructed by Emperor Akbar, the most famous of the Moguls. This fort is located 10 meters away from the main city and is surrounded by a garden. This garden is similar to the Charbagh garden around Taj Mahal. Water channels flow throughout the garden thus making way for a lot of fountains.This is a tomb made completely out of red colored sandstones. The Tomb shape is different when compared to other Mogul buildings. It consists of a large number of arches and Piers. The gateways to the fort are the most beautiful. There are four gates built completely out of sandstones and the southern gate leading to the tomb. Accessing this place from the main city is quite easy. There are lots of bus lines going in and out thus making this place easily accessible. 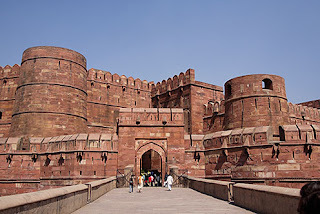 Agra Fort is a UNESCO World Heritage site located in Agra, India. The fort is also known as Lal Qila, Fort Rouge and Red Fort of Agra. It is about 2.5 km northwest of its more famous sister monument, the Taj Mahal and it can be more accurately described as a walled city. The great Mugals, Humayun, Akbar, Jehangir, Shah Jahan and Aurangzeb lived here, and the country was governed from here. It contained the largest state treasury and mint. It was visited by foreign ambassadors, travelers and dignitaries. It was originally a brick fort, held by the Hindu Sikarwar Rajputs. It was mentioned for the first time in 1080 AD when a Ghaznavide force captured it. Sikandar Lodi (1488–1517) was the first Sultan of Delhi who shifted to Agra and lived in the fort. He governed the country from here and Agra assumed the importance of the second capital. He died in the fort in 1517 and his son, Ibrahim Lodi, held it for nine years until he was defeated and killed at Panipat in 1526. Several palaces, wells and a mosque were built by him in the fort during his period. 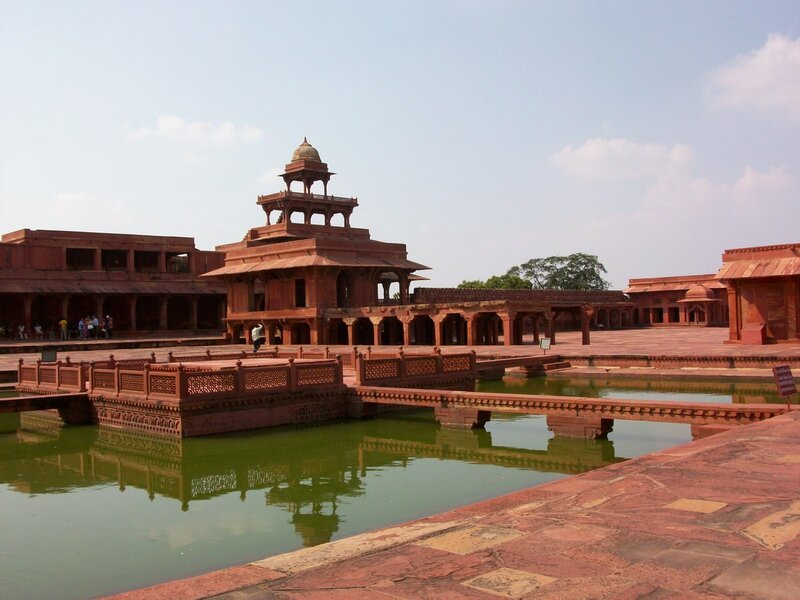 Another place that one must see when he or she is in Agra is the Fatehpur Sikri. During Akbar’s reign, this place was the political capital of the great Mogul empire. This place is famous for its red fort. All the treasure and Arsenal was kept here during their reign. When compared to other cities built by the moguls, this place acts as an innovation for modern times. It also acts as an example for decent revenue system, administrative and organizational place. Fatehpur Sikri sits on rocky ridge, 3 km. in length and 1 km. wide, and palace city is surrounded by a 11 km wall on three side with the fourth being a lake at the time. Its architect was Tuhir Das and was constructed using Indian principles. The buildings of Fatehpur Sikri show a synthesis of various regional schools of architectural craftsmanship such as Gujarat and Bengal. This was because indigenous craftsmen from various regions were used for the construction of the buildings.Influences from Hindu and Jain architecture are seen hand in hand with Islamic elements. The building material used in all the buildings at Fatehpur Sikri, palace-city complex, is the locally quarried red sandstone, known as 'Sikri sandstone'. It is accessed through gates along the five-mile long fort wall, namely, Delhi Gate, the Lal Gate, the Agra Gate, Birbal's Gate, Chandanpal Gate, The Gwalior Gate, the Tehra Gate, the Chor Gate and the Ajmere Gate. Agra is also a place of many religious beliefs. One example for this is the Jama Masjid. Here a large courtyard is constructed where people can gather around to pray. The Jama Masjid is highly integrated with interior writings and tiles of decorative colors and geometrical designs. A shrine of the great Sufi leader Salim Chisti is present inside the mosque. There is an amazing workmanship in the screens of marbles located inside the tomb. It was initially constructed using red sandstone. Aside the fact that the structure is an amazing architectural feat, it also serves as a place of worship for the Muslim complex. This makes the place one of the must-see locations when a person visits Agra. The Itmad-ud-daulah tomb stands in the centre of a grand Persian garden, an architectural gem of its times. It is the tomb of Mirza Ghiyas Beg, Emperor Jahangir’s father – in- law. The structure was built by Empress Noorjehan in memory of her father, between 1622 and 1628 and is very similar to the tomb she constructed for her husband, near Lahore in Pakistan. This splendid garden tomb is believed to be the precursor of the magnificent Taj Mahal, and was the first Mughal structure to be built entirely of marble, and the first, again, to make use of pietra dura, the inlay marble work that came to be typical of the Taj. Located on the left bank of the Yamuna river, the mausoleum is set in a large cruciform garden criss-crossed by water courses and walkways. The mausoleum itself covers about twenty-three square meters, and is built on a base about fifty meters square and about one meter high. On each corner are hexagonal towers, about thirteen meters tall. The walls are white marble from Rajasthan encrusted with semi-precious stone decorations - cornelian, jasper, lapis lazuli, onyx, and topaz formed into images of cypress trees and wine bottles, or more elaborate decorations like cut fruit or vases containing bouquets. Light penetrates to the interior through delicate jālī screens of intricately carved white marble. One of the most beautiful buildings inside the Agra Fort that one must not miss at any cost is the Jahangir Mahal. Jahangir Mahal is one of the monuments that reflect the Akbari Architecture. The structure was built during the reign of Akbar. The structure has served as a palace for the members of the royal family, mostly women. This Mahal is a huge private resident of the then royal family inside the fort. Jahangir’s Palace was the principle Zenana Palace. 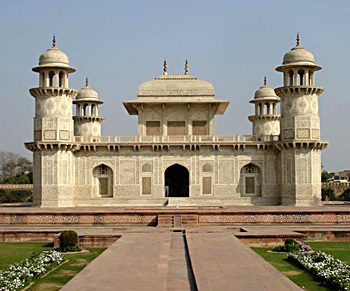 Agra is a wonderful city with many forts and historical monuments. The significant structures that this city holds include Taj Mahal, Agra Fort and Fatehpur Sikri. UNESCO has identified all the three places as World Heritage Sites. Jahangir Mahal is located within the premises of the Agra Fort. It is one of the biggest structures inside the premises and tourists for its architecture. This Mahal was the private resident for Akbar’s Rajput wives. The architecture of Jahangir Mahal is a splendid piece of work. The brackets in the palace are built with a Gujaratis way of approach to a building. The brackets are marvelously carved with flora and fauna patterns and appeals about the style of the Akbari period of architecture. The buildings are also dominating on the fact that most parts of the structure are built in the Islamic Style. 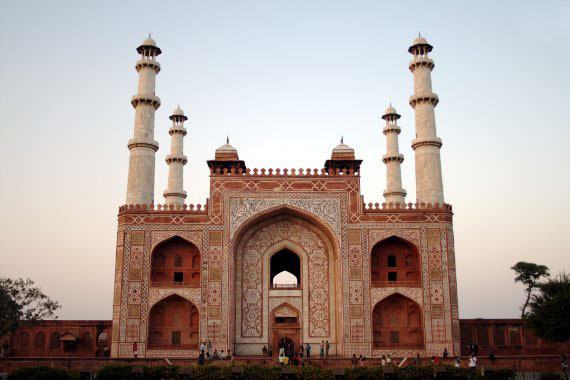 Chini ka rauza, Agra is considered to be the one of the masterpiece of glazed-tile decoration. This mausoleum is in fact a classic example of the Persian influence on Mughal architeture of that period. Parts of the walls are still covered with the colored enamel tiles (Chini) which gave the tomb its name. On the top of the dome you can see some Quranic texts inscribed on it. This really is a magnificent holiday site to visit in every season. 17 kilometer far from Agra, 15 acre of green wildlife area Soor Sarover is the best place to visit and view different species of birds. Soor Sarover is also known as “Keetham Lake”. More than Hundred species of migratory and native birds are found in this heavenly place. It’s a favorite place of nature lovers and picnickers. Soor Sarover is also known for the home of different species of Reptiles and Mammals. In pentagonal of shape it covers around 7.13 kilometers. It’s a place to enjoy the nature and this is the place which inspired Soordas to compose the “Bhakti Kavya”. This is the headquarter of the Radhaswami religious sect, founded in 1861 by Shri Shiv Dayal Singh, also known as Swamiji Maharaj. Being built to commemorate the Supreme Creator, this tall, unfinished facade of marble, lined with exquisitely carved pillars and panels, was estimated to cost about five million rupees when it was conceived. Today, the cost of work finished and work still to be done will run into ten million. It is one of the earliest Mughal gardens, Laid out in 1528 by Babur the first of the Mughal emperors, a couple of kilometers north of Chini-ka-rauza. It is said that Babar was temporarily buried here before being permanently interred at Kabul in Afghanistan. Its original name was Aram Bagh (Garden of Rest). Ram Bagh, the garden of Babur is hot and dry. Emperor Babur, in search of rest and coolness designed Ram Bagh (garden of tranquility). Originally from Afghanistan he was a great lover of gardens and introduced this type of garden to the largely Hindu India, and his successors embroidered on his theme as far as garden design was concerned. It is especially because of the many religious and symbolic meanings that the ground of the Persian gardens has not changed dramatically. There are many such places similar to the ones mentioned about that quite worth visiting in Agra like . Proper accommodation, decent transportation, green environment and decent support by the government for the tourists makes Agra one of the most sought after place to visit by every person at least once in his life.